Game Center is Apple's online gaming network. It lets gamers use their iOS devices to connect, compare and compete against each other. Games developed for iOS devices using Unreal Engine 3 support the use of Game Center, allowing these games to take on a very social and community-driven experience. Note: GC will be used in the following sections to refer to Game Center. Note: It is important not to reference OnlineSubsystemGameCenter directly within Unrealscript as that will cause problems when you attempt to launch UDK on the PC. Always use the OnlineSubsystem reference, and depending on the platform, Unreal Engine 3 will automatically use the correct type of OnlineSubsystem. GC is supported in Unreal Engine 3 on iOS via the OnlineSubsystemGameCenter interface. However, since it brings up the Game Center login/welcome back screen automatically during startup, GC can be enabled and disabled by a configuration file. This is to allow developers to turn this off during development where GC testing is not required, set this to true. Otherwise, set this to false. When you use iTunes Connect to create achievements and leader board categories, you must name them starting with whatever prefixes you've specified and then append 01, 02, 03, and so on for each one. (When you unlock achievement one, the code will append 01 to your UniqueAchievementPrefix). For UDK users, you must set both the Unique and Epic achievement prefix and category prefix. You may need to compile OnlineSubsystemGameCenter before using Game Center for your iOS game. To compile OnlineSubsystemGameCenter, you need to add it to the EditPackages array in DefaultEngine.ini. Once added to the EditPackages list, you will then need to recompile your Unrealscript source code. The OnlineSubsystemGameCenter package should now appear in the UDKGame\Script folder. Click here for more information on compiling Unrealscript. Call OnlineSub.PlayerInterface.AddReadAchievementsCompleteDelegate() to be notified when reading the achievements data has been completed. Call OnlineSub.PlayerInterface.ReadAchievements() to start reading achievements. In your delegate, note the achievements that have been read, so you can now query their state. Player is playing game, achievement criteria is met. Call OnlineSub.PlayerInterface.GetAchievements() to get the state of all achievements. Look in the returned array for the achievement whose ID matches. Do not use your achievement ID as an index into the achievement array! For one thing, achievement IDs use 1 as their array starting index (Unrealscript and many other languages use 0 for starting array indices). Call OnlineSub.PlayerInterface.UnlockAchievement() to tell GC the player has unlocked the achievement. To let the player see what achievements they have unlocked, you may either use your own UI (using the results of OnlineSub.PlayerInterface.GetAchievements()), or display the GC built-in screen. To do this, simply call OnlineSub.PlayerInterfaceEx.ShowAchievementsUI() and the GC UI will slide onto the screen. When the GC code starts up, it will immediately start downloading achievements, so by the time your game code is running, they should already be downloaded. However, to be safe, use the OnlineSub.PlayerInterface.ReadAchievements() call with a delegate to make sure that the achievement download has completed, and that OnlineSub.PlayerInterface.GetAchievements() will return truly valid results. Under the hood, there is much complexity happening for achievements, because if the user is off line when an achievement is unlocked, GC won't ever tell the server. So, we maintain a local achievement state, which is saved to the iOS flash disk. Whenever the user connects to GC at a later time, the engine will check for any differences between the remote achievement state and local achievement state, and merge the two, updating the remote side by unlocking achievements without showing a UI. Note: If achievements ever have their IDs set to -1, then the achievement was not properly downloaded, UniqueAchievementPrefix and or the EpicUniqueAchievementPrefix were not set up correctly. In this example, an achievement handler actor class is created to allow you to forward achievement calls to it. You can of course, shift this into another class such as your custom GameInfo class. The achievement handler works by storing a pending achievement list (in case several achievements are earned in rapid succession), then calling asynchronous functions which will loop between themselves until all of the pending achievements have been unlocked. To unlock an achievement, YourAchievementHandler::UnlockAchievement() is called with the achievement id as a parameter. This achievement id must match the number at the end of the achievement id. For example, an achievement with the id of com.epicgames.exploreue3.achievement_01 will have the achievement id of 1. Remember that achievement ids usually always start with 1 and not 0. 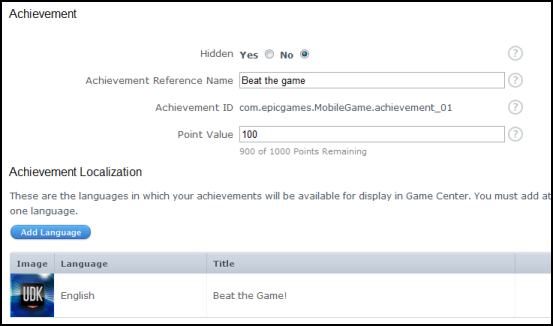 The first check is to ensure that the achievement id is within the pending achievements array. This prevents achievements from being unlocked multiple times. If the achievement handler is not currently processing any achievements, then start processing the pending achievements and set the ProcessingAchievements flag true. This is to start the asynchronous achievement processing loop. From here a delegate which is called when achievements have been read from the server is finished is assign, and the asynchronous call to read the achievements is performed. This function is a simple helper function which returns the local player controller id. * Returns a local player controller id. Same rules apply to Actor::GetALocalPlayerController(). When the achievements data have been read from Game Center, YourAchievementHandler::InternalOnReadAchievementsComplete() is called. The DownloadedAchievements array is first cleared to ensure that there is no data there and PlayerInterface::GetAchievements() is the called to fill the DownloadedAchievements array with the recently downloaded achievement data. From there we can perform a quick array index search using the first pending achievement id as the key. If the achievement was not achieved online, then the delegate which is called when an achievement is unlocked is set and PlayerInterface::UnlockAchievement() is then called. This starts the asynchronous request to unlock the achievement through Game Center. The read achievements delegate is then removed so that garbage collection can properly occur. When Game Center responds saying that the achievement has been unlocked, YourAchievementHandler::InternalOnUnlockAchievementComplete() will be called as it was assigned to the delegate earlier. This is where you would show something on the graphical user interface and or play a sound to indicate that an achievement had been unlocked. The achievement id is then popped off the PendingAchievements array. If the PendingAchievements array still has more achievement ids to be unlocked, then the process is looped again. Otherwise, the delegates used are cleaned up and the ProcessingAchievements flag is set back false. Finally it is important to ensure that all delegate references have been cleared; otherwise garbage collection can occur correctly. The other major non-multiplayer feature of GC is leader boards. Again, they tend to work in a similar fashion to other platforms, but there are some limitations to GC leader boards. GC actually only supports one "leader board" with multiple "categories". We treat the categories as columns in a table for the one leader board. However, all categories are displayed, with their UI, with the same format and label, so all categories could be time, or integer points, or integer kills, etc. Additionally they are all either ascending or descending. This will affect how you set up your scores. To report scores, you create a subclass of OnlineStatsWrite and set up its properties (with 1 based IDs) in the defaultproperties block. From there, you create an instance of the object, set the values, and then report with OnlineSub.StatsInterface.WriteOnlineStats(). If you read multiple rows of multiple columns, then the rows will be sorted based on the first column (this may change later to use a ranking column). Similar to the achievements, if a score is reported while the user is offline, GC won't automatically resubmit it. So, we do a lot under the hood to save the highest and lowest score reported to disk, and then we report them to the server next time the user signs in. We don't know if the leader board is ascending or descending, which is why it submits highest and lowest. When reading stats, all the scores are reported as QWORDs / Int64s (64 bit integers, which have a range of − 9,223,372,036,854,775,808 to 9,223,372,036,854,775,807), which is how GC stores leader board values. Multiplayer is supported, currently only as lobby-based-matchmaking with up to four players. Due to GC handling the network traffic via a GKMatch object, only players discovered via GC matchmaking can be communicated with for game networking. One of the four iOS devices will act as the server. Note: The GameSettings object that is passed to ShowMatchmakingUI() is currently unused and can be None. Currently there is no way to choose who is the server - each player enters matchmaking mode, and then one is chosen as server, and the rest are clients (for a given set of players, the same player will always be the server - it uses the unique identifiers of each player to decide who is the server, this way each device knows if they are a client or server without additional communication). Depending on if the player is chosen as server or client, one of two delegates will be called after matchmaking completes. For servers, the OnCreateOnlineGameComplete() delegate will be called. For clients, the OnJoinOnlineGameComplete() delegate will be called. You should register both of those delegates in your game to handle both cases. In your Join (client-side) delegate, you can use OnlineSub.GameInterface.GetResolvedConnectString(SessionName,URL) to retrieve a URL that can be used to travel to the server (via ClientTravel(URL, TRAVEL_Absolute)). Important: When accepting an invitation (see below), PlayerController has code that will add a Join delegate and then travel to the URL. See OnInviteJoinComplete() in PlayerController.uc. Because of this you only need to register a Join delegate when the user has chosen to enter matchmaking mode. In your Create (server-side) delegate, you would generally do something like ClientTravel(SomeURL, TRAVEL_Absolute) to load the map. Clients will have the server connection information, and will join the server by opening the connection URL. This delegate will be used if the user entered matchmaking or if they accepted an invite and was then chosen to be the server, so you should always have a Create delegate registered. GC supports inviting players from its matchmaking UI. If the invited player is playing a different game, they will see an invitation message, and if they accept the invitation, it will launch your game, and when the game boots up, the GC matchmaking UI will slide up to show the player they are joining the match. If the player is already in your game, the code in PlayerController (see OnGameInviteAccepted()) will tear down any current online game, and then bring up the GC matchmaking UI to show the player they are joining the match. Note that the invited player may actually become the server. GC has a very basic, easy-to-use Voice Chat system. After you have entered a multi player game, you could call OnlineSub.VoiceInterface.StartNetworkedVoice() to have the players talk to each other. Muting and querying for who is talking works as well, using the standard functions MuteRemoteTalker(), IsRemotePlayerTalking(), etc. Whenever you bind to any of the Online Subsystem delegates, it is important to ensure that they are always cleared whenever the level is scheduled for garbage collection. This is important, as otherwise, garbage collection will fail causing chunks of memory to never be released! The Kismet Online Subsystem development kit gem describes this in further detail. Kismet Online Subsystem - This development kit gem demonstrates how to add Kismet nodes which interface with Game Center. YourAchievementHandler.uc - Download the source code for the Achievement example.